Let’s be honest. How many of us like to pay bills? Wouldn’t it be great if there was an option to reduce your mobile phone bill? 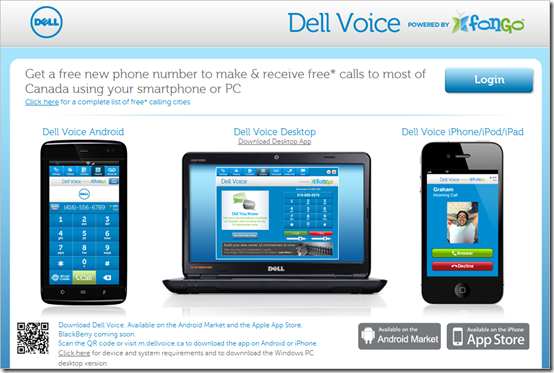 Now there is a complete solution for making and receiving free phone calls from your mobile device and it is called Dell Voice www.dellvoice.ca. Today, Dell Canada and Fongo launched a new Android and iOS app, Dell Voice, a free full feature VoIP phone alternative that lets you make and receive local and long-distance calls for free. Dell Voice uses Voice-Over Internet Protocol (VoIP) technology to place and receive calls with your existing data plan (3G/4G) or nearby Wi-Fi connection. You can call any mobile or landline phone number in Canada (not just peer to peer) using your 3G, 4G, or Wi-Fi data connection, without using your carrier’s voice minutes. Dell Voice will never use your carrier minutes and does not require a voice plan. It also includes free features that users usually pay extra premium under their carriers’ plan such as: Voice Mail, Caller ID and Call Waiting. Network data charges may apply. Thanks to these free features and service, I truly believe Dell Voice has the potential to help Canadian businesses and consumers reduce their mobile phone bills. And there’s a little bonus too – because Dell Voice works on a true Canadian CLEC network, users of Dell Voice can pick a Canadian phone number when they download the app, as well as to make VoIP 911 calls from their smartphone in case of emergency. Dell has been a pioneer in providing clients with the most advanced and cost-effective solutions to meet their communication and computing needs. Dell Voice is yet another important element in our commitment to offer Canadian businesses customers and consumers with technological offerings that help them stay connected and efficient, without breaking the bank. Dell Voice is available to download from the App Store and the Android Market. A BlackBerry version will be available in March 2012. For further information visit Dell Voice www.dellvoice.ca, or click on the image below. Will there be a Dell Voice app for Windows Phones?? ?